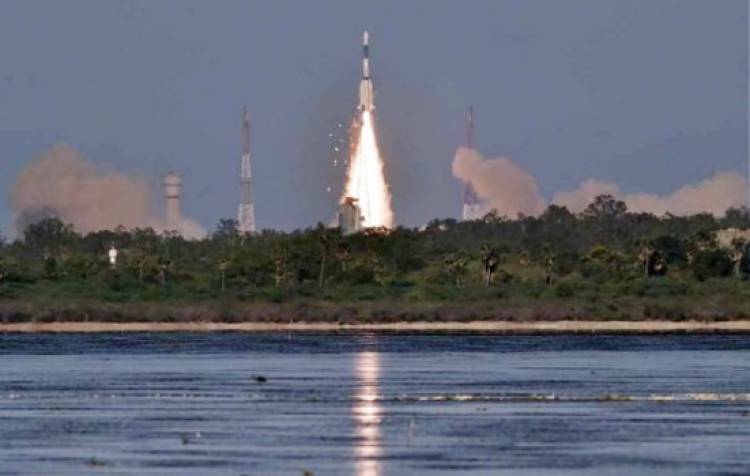 Sriharikota (Andhra Pradesh): The Indian Space Research Organisation (ISRO) on Monday put the Emisat, an electronic intelligence satellite for the Defence Research and Development Organisation (DRDO), and 28 other foreign satellites into orbit in a copy book style. With Monday's launch, India has successfully put into orbit 297 foreign satellites till date. The notable aspects of this space mission are the flying of a new variant of Polar Satellite Launch Vehicle (PSLV), switching off and on the fourth stage engine couple of times and the use of the fourth stage as an orbital platform carrying three experimental payloads. After the successful launch, the space agency's Chairman K. Sivan said: "Today the PSLV has successfully injected the ISRO-made Emisat satellite and 28 customer satellites at a 504 km altitude. "The mission is special for the ISRO on many counts as it was the first time a PSLV rocket was launched with four strap-on motors; the mission has three different orbits for the very first time; the fourth stage was made an orbital platform for experiments; and there was also a new team for the PSLV." Sivan said the industry contributed a lot for the building of the rocket and satellite. "Ninety five per cent of the rocket hardware and 60-65 per cent of satellite components was fabricated by the industry," he said. At 9.27 a.m., the PSLV rocket standing at 44.5 metres tall and weighing 239 tonnes with a one-way ticket, hurtled itself towards the skies. With the fierce orange flame at its tail lighting, the rocket slowly gathered speed and went up. Heeding to the demand of the public to view the rocket launch, Sivan said that a viewers gallery was built and 1,200 people enjoyed spectacle. He said for the next mission about 5,000 people will be allowed to witness the launch. The PSLV is a four-stage engine expendable rocket with alternating solid and liquid fuel. In its normal configuration, the rocket will have six strap-on motors hugging it's first stage. On January 24, the ISRO flew a PSLV with two strap-on motors while in March, it had four strap-on motors. The space agency also has two more PSLV variants -- Core Alone (without any strap-on motors) and the larger PSLV-XL. Forty-seven seconds later after the launch, the Emisat was ejected at an altitude of about 753 km. Meanwhile, at about 60 minutes after the PSLV's lift-off, its fourth stage was restarted and run for about 10 seconds before it was cut off again. At about 108 minutes after the lift off, the rocket's fourth stage was again restarted for few seconds before it was again cut off. Finally, at about 110 minutes, the first of the 28 foreign satellites were ejected and in five minutes, they were put into orbit. Again the fourth stage will be restarted and stopped twice to bring its altitude to 507 km at the end of three hours after the lift off. At this point the fourth stage will turn into an orbital platform for three experimental payloads: (a) Automatic Identification System (AIS) from ISRO for Maritime satellite applications capturing messages transmitted from ships (b) Automatic Packet Repeating System (APRS) from AMSAT (Radio Amateur Satellite Corporation), India - to assist amateur radio operators in tracking and monitoring position data and (c) Advanced Retarding Potential Analyser for Ionospheric Studies (ARIS) from Indian Institute of Space Science and Technology (IIST) - for the structural and compositional studies of ionosphere, the space agency said. India will also launch two more defence satellites sometime in July or August with its new rocket Small Satellite Launch Vehicle (SSLV). அரசு பள்ளியில் தன் குழந்தையை சேர்ந்த ஐ.ஏ.எஸ். அதிகாரி!